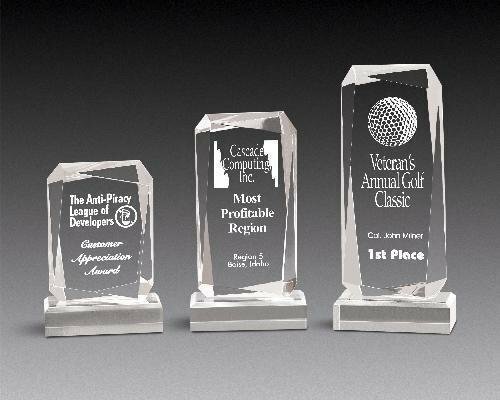 Elegant is the only term that one can use when describing these 1" thick Faceted Rectangle Acrylic Awards. 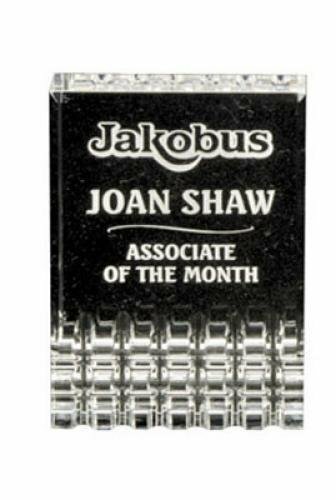 Each piece has many 3D faceted cuts on the bottom that give this acrylic award a unique design while leaving a large engraving or laserable area that can accommodate any of your personalization needs. Flexibility is a key component for these awards as they are offered in either Jade or Clear and your choice of three sizes 5" X 3 1/2", 6" X 4 1/4", or 7" X 5". These are beautiful awards that anyone would be proud to give or receive. Pure K9 premium optic crystal award. A world map is etched from the back in the concaved circle. A red crystal disc is used to connect the main panel with the base. Available in two sizes.